POTOMAC FALLS, Va. — President Donald Trump says that the United States is prepared to act alone if China does not take a tougher stand against North Korea’s nuclear program. Trump’s comments in an interview with the Financial Times come just days before he is set to host Chinese President Xi Jinping at his Mar-a-Lago estate in South Florida. The two are expected to discuss a number of issues, including North Korea, trade and territorial disputes in the South China Sea during their meeting on Thursday and Friday. Trump said trade was the incentive for China to work with the United States. Still, he said the United States could “totally” handle the situation in North Korea without China’s help. While China provides diplomatic and economic support to its neighbor, it claims that its influence over Kim Jong Un’s government is limited. The relationship between the United States and China has been uncertain since Trump’s election. 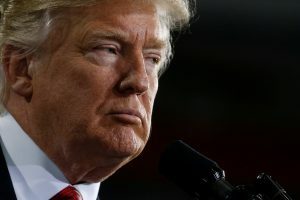 During his campaign he accused China of unfair trade practices and threatened to raise import taxes on Chinese goods and declare Beijing a currency manipulator, though it is unclear whether Trump will follow through with either threat. Trump’s ambassador to the United Nations Nikki Haley, also offered tough talk on China, saying on ABC’s “This Week” that the U.S. is pressing China to take a firmer stand regarding North Korea’s nuclear program. “I’ve been working on the North Korea problem since 1994,” Carter said on ABC. “And we have consistently asked Chinese leaders … because they uniquely have the historical and the economic relationship with North Korea to make a difference.